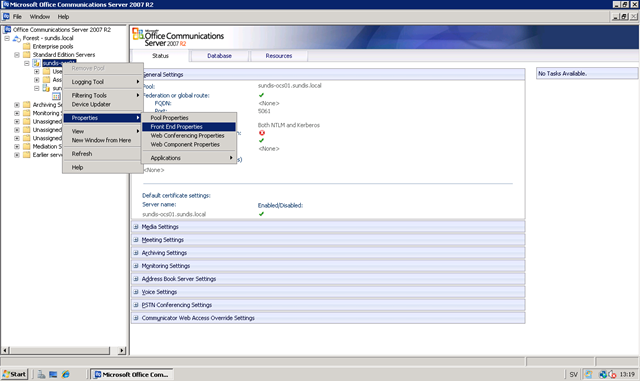 I have seen a number of posts in different forums with questions on how to integrate Office Communications Server2007 R2 with Outlook Web App in Exchange Server 2010 Service Pack 1. There are some changes made in SP1 that will cause your current integration to break. But this can be easily fixed with a couple of configuration changes. Well, changes in this case is good. What Microsoft has done is to move the Instant Messaging settings for the OWA virtual directory from web.config to Active Directory where it should be. It’s better to have all parameters for OWA virtual directory gathered in one place, right? Below, I will walk you through the complete configuration process. If you only want to read about the configuration related to SP1, scroll down a bit to configuration! Download and execute CWAOWASSPMain.msi to you Exchange Server 2010 CAS. In Windows Explorer, navigate to the directory where the files from CWAOWASSPMain.msi were placed. The default location is C:\Web Services Provider Installer Package\. Go to Start > All Programs > Accessories, right-click Command Prompt, and then click Run as Administrator. Go to the directory where the files from CWAOWASSPMain.msi were placed and run CWAOWASSP.msi. Install the other updates listed under pre-requirements above. Done, you should now have all the required components installed on you Exchange Server 2010 CAS. Now you should be all set! You do however need to make one last finishing touch on the Office Communications Server. That is to add the FQDN of the certificate that you specified in the Set-OwaVirtualDirectory command above as a trusted host in you OCS server. To do this Navigate to the pool or server in OCS, right click on your pool or server and select Properties and then Forest End Properties. Open the Host Authorization tab and then click Add. 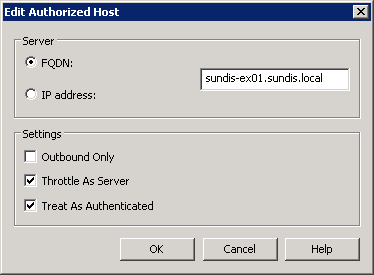 Enter the FQDN found on the certificate you added in the previous step and make sure that you check Throttle AS Server and Treat As Authenticated, when finished click Ok. The FQDN will most certainly include a external domain in your case. In my case it’s an internal domain for testing purposes. Make sure that all settings are correct, when finished click Ok.
Give OSC a moment to apply the settings and then head of to OWA and enjoy! Thanks for reading and don’t hesitate to comment if you have any further questions or thoughts about the post!